Fall is officially here!!! Football. Crisp Weather. Changing Colors. And most of all PUMPKINS! I love pumpkin anything, so naturally, the pie pumpkin is one of my favorite things to cook with this time of year. These tasty little things can be used for so much more than decorating or carving. So get ready for pumpkin everything!! Make sure to preheat your oven to 350 degrees. Now to prepare the pumpkin...get your vegetable peeler out. I find it easiest to peel the pumpkin along it's natural seems (vertical). I like to remove all of the skin, but it won't hurt you to leave it on if you want to save a step. Once the skin is removed, cut the pumpkin in half once. Then slice into wedges. Take a spoon and by scraping the inside of the wedge remove the seeds. *Tip: you can set the seeds aside and roast them for later. They make great additions to salads! 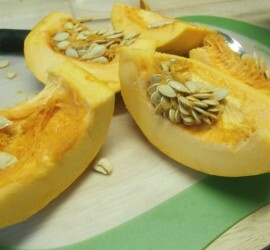 Once the seeds are removed, cut into smaller wedges and place in a bowl. Drizzle about 2 Tbsp of olive oil in bowl. Add the curry powder and black pepper. 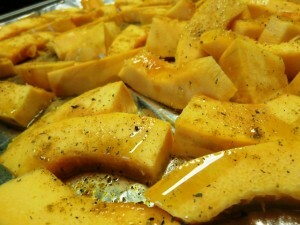 Toss until the pumpkin slices are coated evenly. Spread onto a baking sheet and bake for about 20-25 minutes. 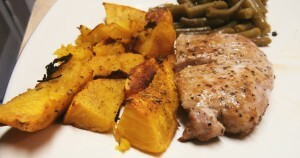 Remove from oven and savor this yummy seasonal dish! What is your favorite way to use pumpkins?! Previous Post Why refer patients to Weightwise?